An ideal hotplate is one that has a stable, flat & easy to clean surface, which is evenly heated and offers a refined temperature control - see temperature settings. For small heating requirements or a useful working palette the encaustic painting iron can be upturned and relocated into the handle structure, providing a simple small hotplate. NOTE: with the handle attached as normal the upturned iron makes a useful and highly manouverable working palette, especially for close-up fine brushwork where retaining molten wax colour on the brush fibers is vital. The A2+ Ultimate Hotplate is made for encaustic use, with a toughened glass surface and excellent thermostatic temperature control. This offers everything needed for use with molten wax art work using the encaustic art wax block formulation. NOTE: *It is only hot enough to melt very shallow flat bottomed tins of resin wax types. THE A2+ ULTIMATE HOTPLATE FOR ENCAUSTIC ART WORK - MELTDOWN! * Attractive & Robust design ! This video clip will show a few introductory ideas and ways of using the hotplate with the encaustic art wax block colours. These are usually used in a range of methods where direct contact of wax or substrate to the hotplate surface is utilised. 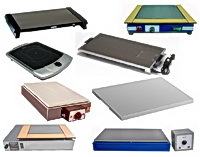 There are many ways of using the hotplate and although it is a costly item it is excellent quality and very durable. *not ideal for resin wax heating due to remaining lower than 90C in use. The following gives a rough guide to thermostat steeings for the A2+ Ultimate Hotplate. These readings were done in a room with an ambient temperature of around 20C. 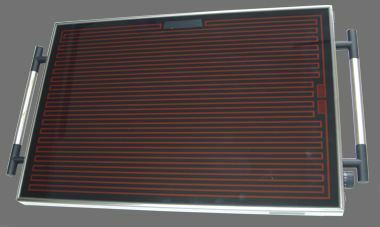 Heatloss from the hotplate suface will be afected by the ambient temperature. Many factors will affect the exact temperature, but this hotplate will not get too hot for wax usage. Even when left on full power at No.12 and untouched for a long period, the thermostat will hold the steady top temperature varying as it switches on and off within about 3C to 5C. NOTE: When using tins to melt the waxes the temperature at the contact point with the hotplate will be hotter than the top surface of the wax. To melt wax in pots much deeper than 1" molten liquid will require considerably more heat at the base in order to maintain fluid wax a the surface - in other words the wax could easily be overheated. So it is better to use shallow pallette tins - ideally these need to be flat bottomed to ensure good heat transfer - baking trays with circular holes and angled sides are the ideal. The baking tray makes a great mixing pallette for larger amounts in the many wells available too. This hotplate offers brilliant temperature control that varies almost unnoticably in the working situation. The dial spans from 1 to 12 and placing 7 at the top is around 70 - 75 C. So there is plenty of fine adjustment from the melting point of the wax blocks (around 65C) all the way up to 100C as the maximum achievable temperature. Hotter temperatures enable tin palettes (flat bottomed muffin tins) to be used effectively, creating pools of liquid wax colour during operating times. This enables techniques for brush painting with molten wax onto cold supports. Often this type of brushed on wax is then "fused" using hot air tools. There are too many possible techniques to mention here but you can find some useful step by step pages in the techniques section above which are well worth visiting. Sizes in the pack are 2mm / 4mm / 8mm / 12mm & 20mm . The Painting Iron or Hotplate can be used with a muffin tin to contain your wax colours and keep them molten. Brushes can rest on the hotplate to remain warmed adn ready to use. Scrapy Wax Movers are rubber style tipped tools to move molten wax around, to create marks and textures. Great for Hotplate and Hot Air techniques. Easy to clean and very durable too. * Also for application of glue in scrap booking, cardmaking or fidldy places. These can also be used with any liquids, paints, or even modelliing materials for making marks, etc. Sponges come in all shapes and forms. This small set contains 3 white rubber type sponges that are good for moving the wax colours around on the hotplate or during hot air working onto card, canvas or board. The orange sponge is textured and also far more absorbent. This is good for creation of textures, foliage for instance. All the can be cut into other forms or angles and even torn to give more random edges. * Remember that certain sponges & plastics can melt!